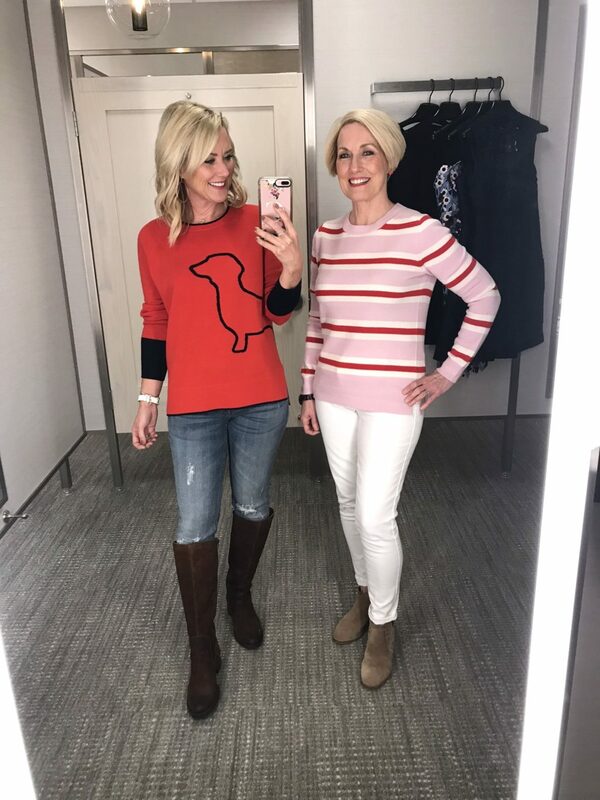 Thanks for your love on this week’s Amazon post, featuring 10 darling Fall outfits, along with our Fall Home Tour and my recap of our time in Dublin and the Irish Coastline. It’s hard to sit on opposite sides of the computer sometimes, so I always love hearing from you! 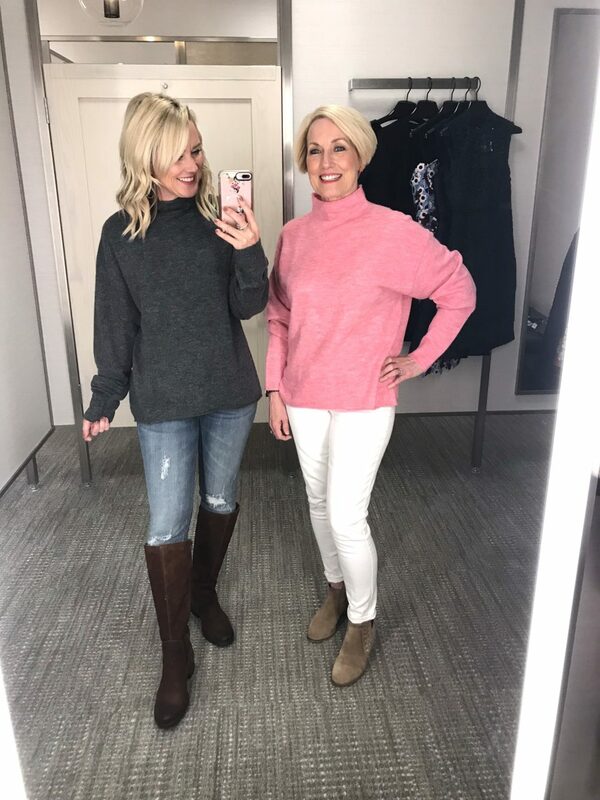 Today I’m excited to bring you another Dressing Room Diaries, and this one is a beast, with so many great finds for Fall. Plus, I have Mama Sugarplum with me, so you know it’s got her special charm! Fit Note: I’m 5’4″-ish, 120 pounds-ish (depending on the week’s taco count), with a slight pear shape. My usual size is XS/0. 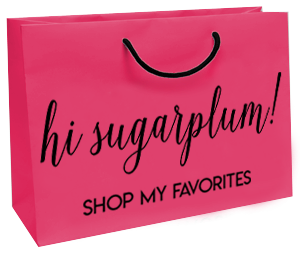 Mama Sugarplum is 5’1″, with an hourglass figure. Her usual size is XS/2p. Let’s start with our favorite find, shall we!? Ya’ll always want to know what actually came home with us from these shopping trips, and we both immediately grabbed this one! In fact, I now have it in several colors! 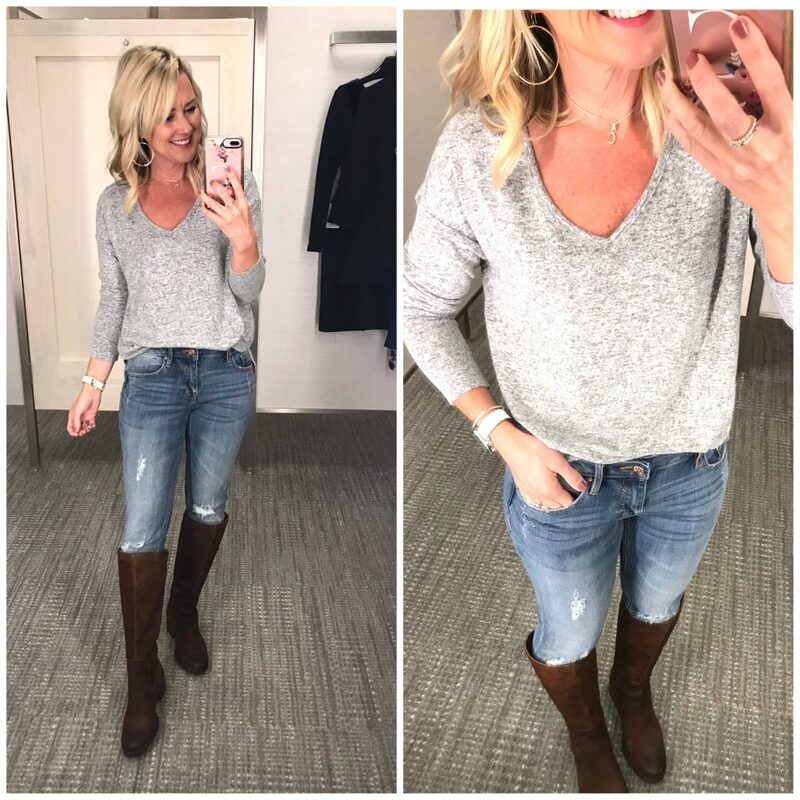 It’s the perfect top for chilly Fall days…soft, comfy, great with jeans or leggings, and super cute! Bonus that you can wear it with the wrap in front or back, giving you more styling options. Fit Tip: We’re both wearing XS regular. It’s cute when sized down for a smaller fit, too. Here’s a peek at the first time I shared it…you can see other colors and the way the wrap looks when worn on the back. Obsessed is too mild a word for this pullover! 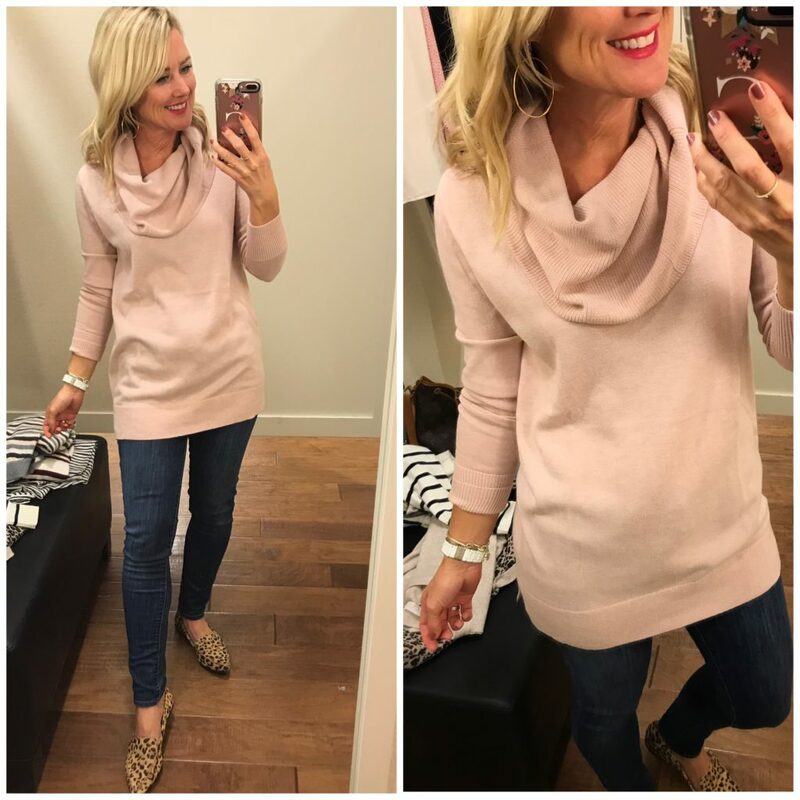 I’m crazy for the pink and plum combo, and the cute funnel neck. It’s super lightweight, but not sheer. It would be darling layered under a jean jacket, too. Oh, and it’s 40% off and now mine! Fit Tip: I sized up to a small for a longer, relaxed fit. 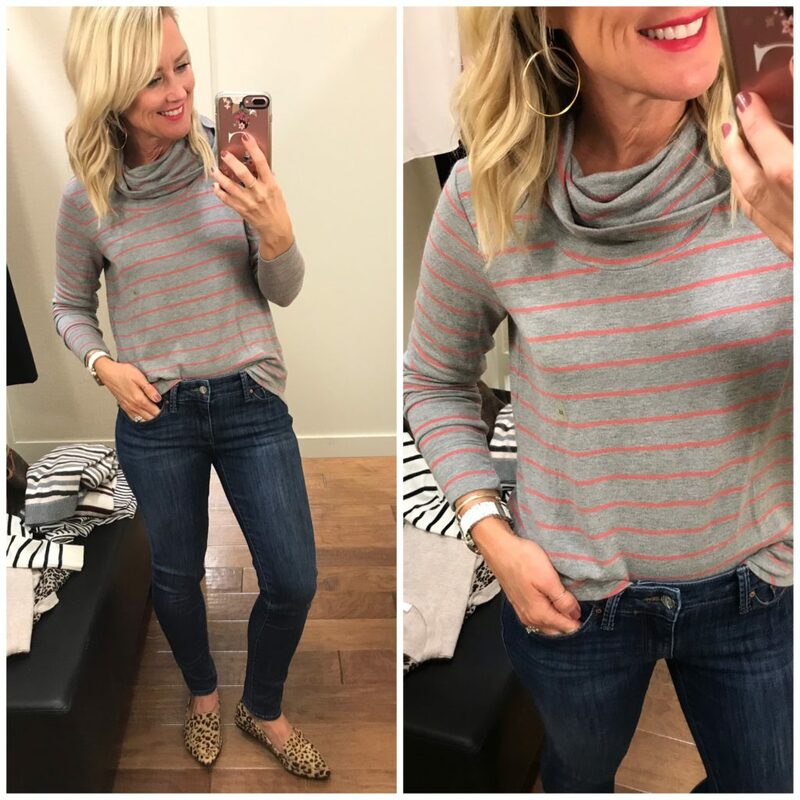 I never met a stripe I didn’t love, and this cashmere-blend sweater combines all the best Fall colors. It’s soft with an easy fit and great mid-weight. 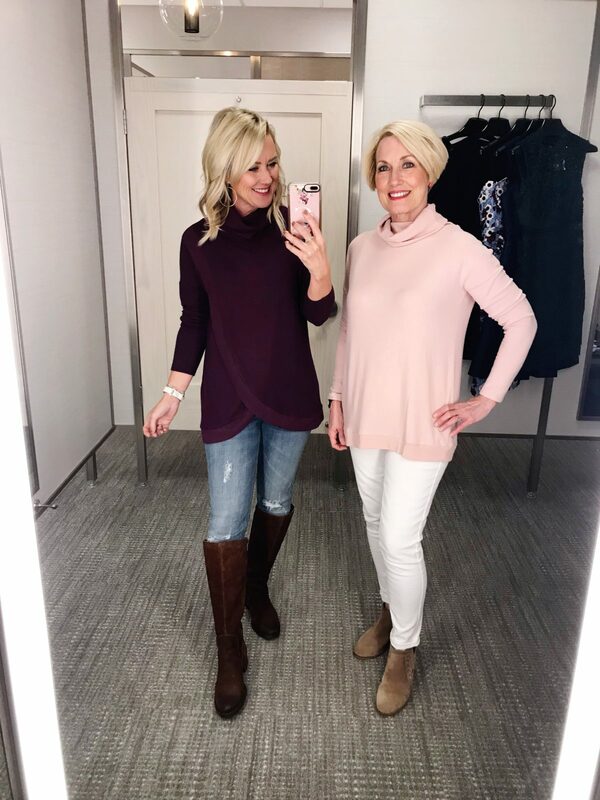 I shared this slouchy mock-neck sweater with you in the last DRD, and Mom was anxious to try it for herself! It’s crazy soft with a relaxed mock-neck and sleeves. She was crazy for the pink, but I took home the gray. 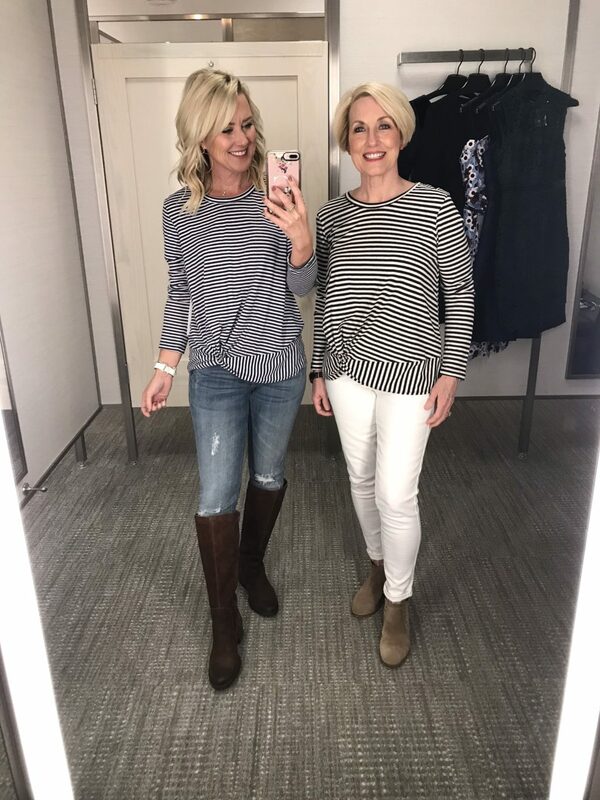 Fit Tip: It runs large, but we’re both wearing our usual XS for the oversized fit. Here’s a close-up look from the last post. I ran in to Loft last night (hello, everything is 40% off! ), and it was one of those times when I wanted to keep everything I tried on!!! Definitely a jackpot going on over there right now. 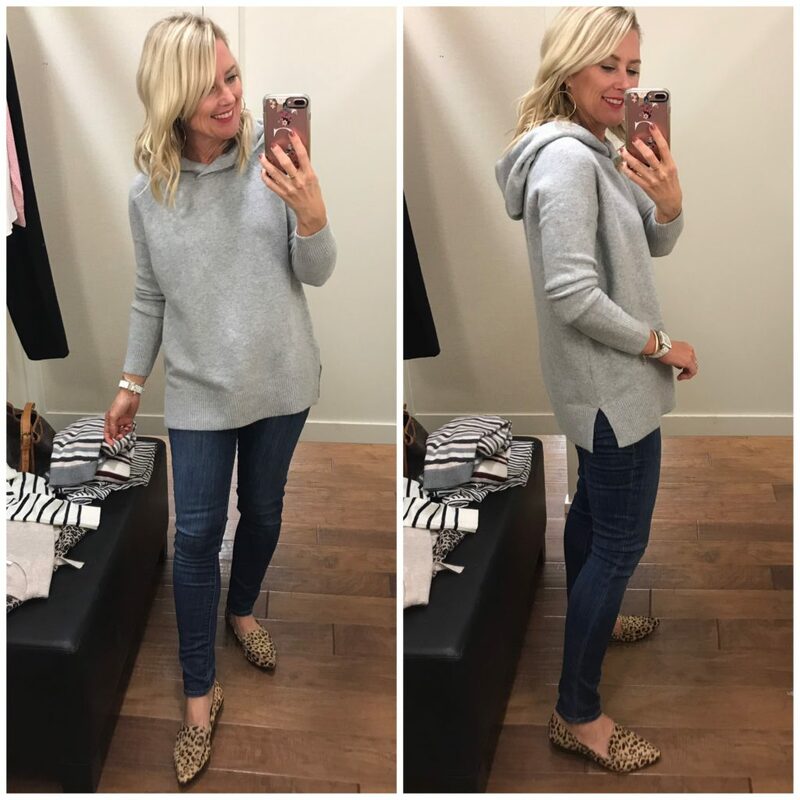 Including this world’s cutest hooded pullover sweater!!! Do the number of exclamation marks adequately express my excitement for this one? It’s soft and thick and stretchy, and I’m already planning to wear it tomorrow…regardless of the weather. I’ll wear it with flats, boots and even sneakers. 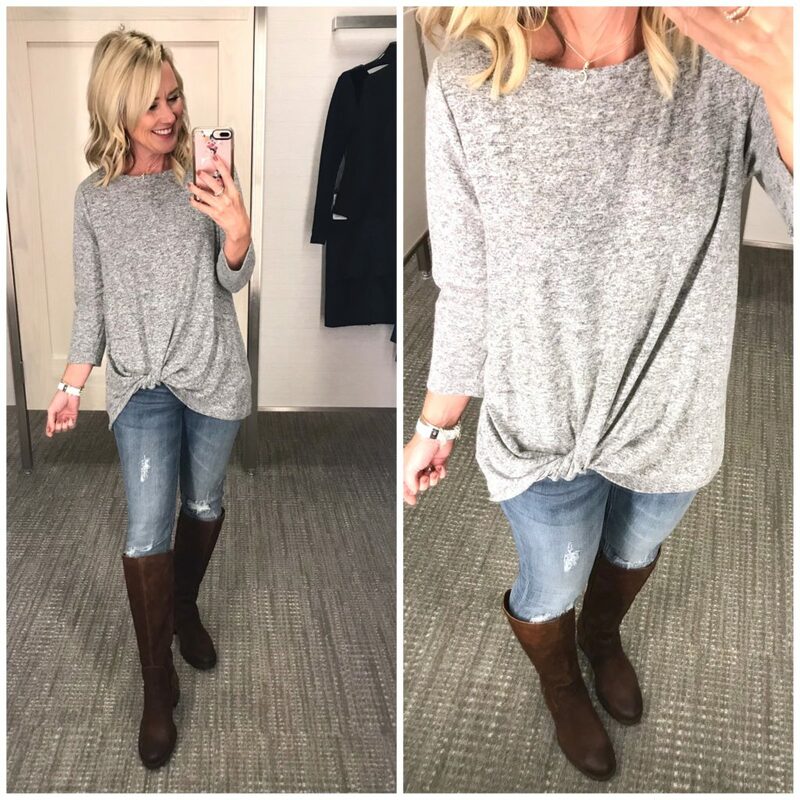 This tunic sweater is perfect for this transitional weather…lightweight and soft, but not so thin your bumps show through. It’s long enough for leggings and comes in a bunch of great colors. It’s also 40% off! 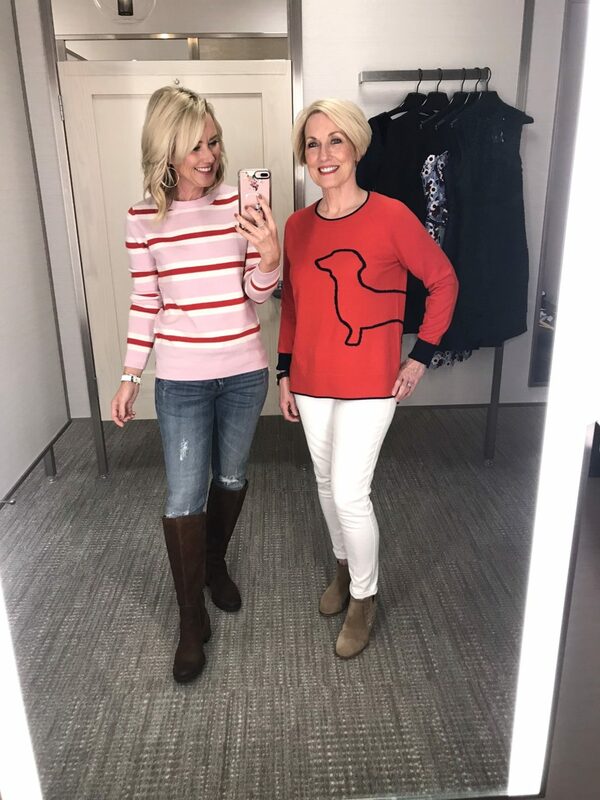 How could I not try this darling dog sweater? Actually, it was Mama SP who grabbed it first…she’s an even crazier dog-person than we are! The sweater is a soft cotton knit in a great medium weight, perfect for wearing alone or layering over a collared shirt. It has a high-low hem and side slit. You have to see the other fun prints, too! Mama SP is wearing a small, as well. 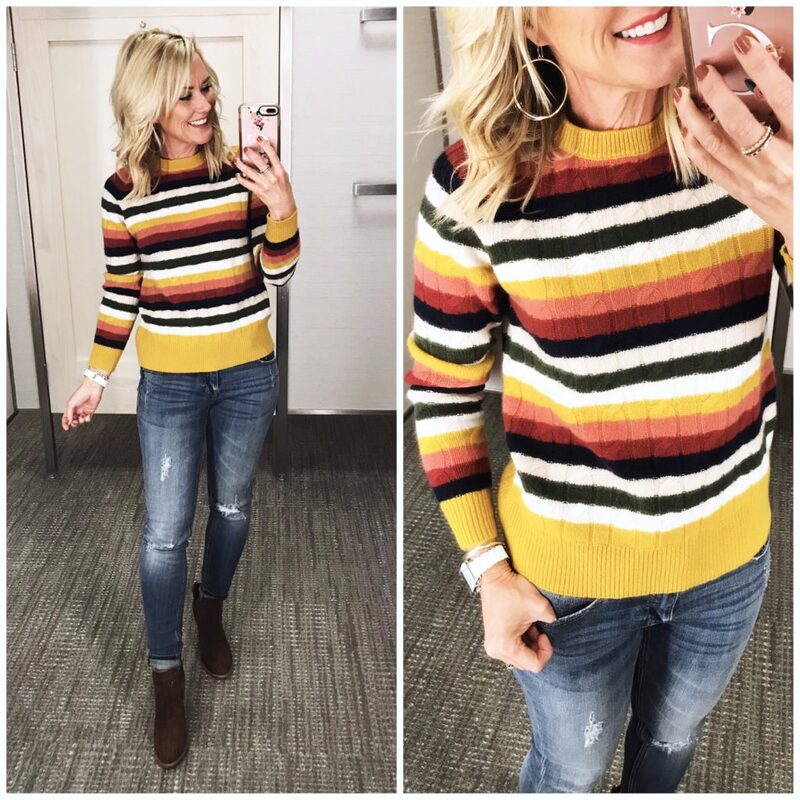 Remember this striped sweater from last time, too? Yeah, she couldn’t wait to try it, either! She’s wearing a small. 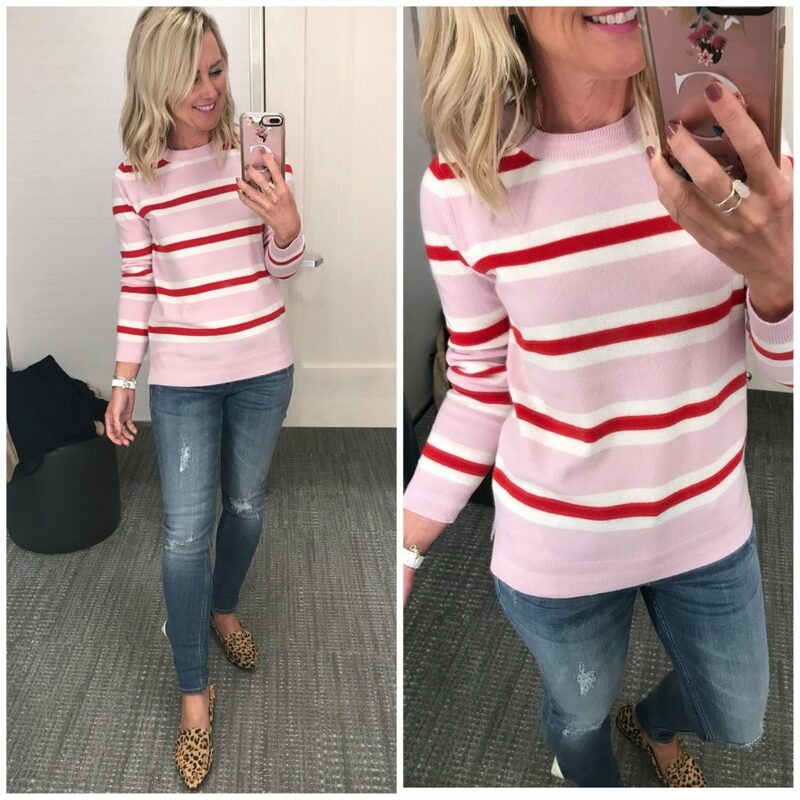 I love the button detail on this crewneck sweater, along with the textured stripe. This one is a wool blend (and a little itchy), but the solid colors are cotton. Mom is wearing the cotton-blend…sort of a thick cable knit, with the same cute button detail. 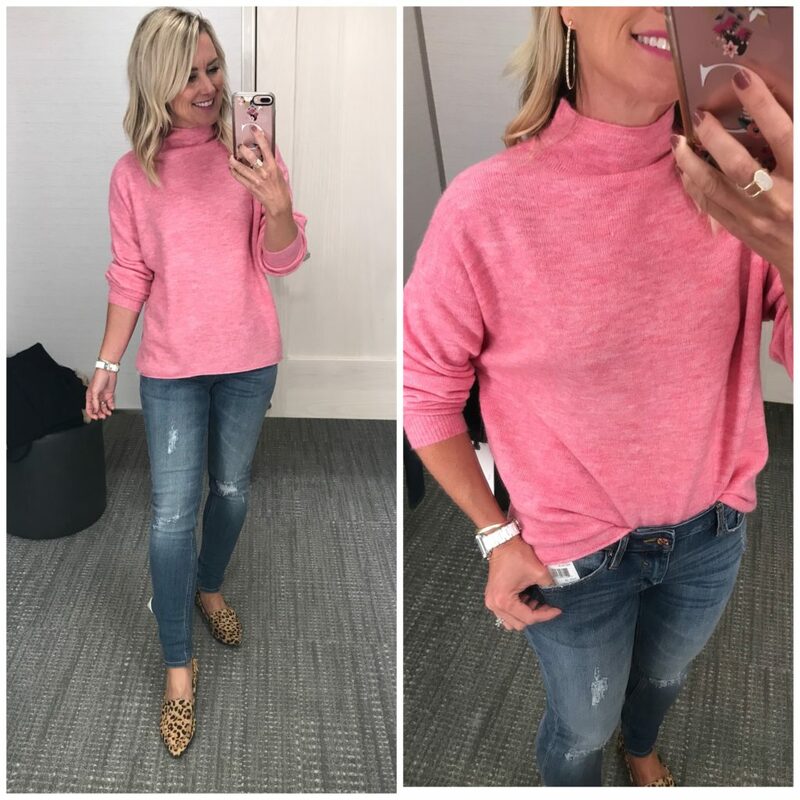 My friends at Gibson know how to do cozy, and this pullover in their signature fleece is perfect for jeans and athleisure. 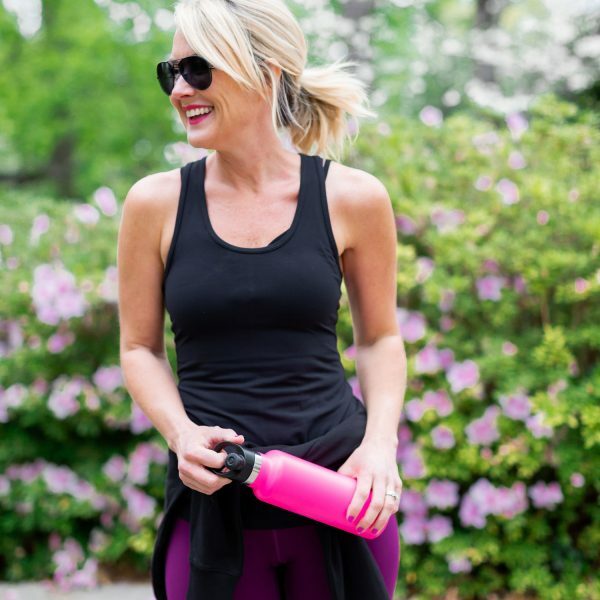 It has a three-quarter sleeve and built-in twist tuck…and crazy soft! 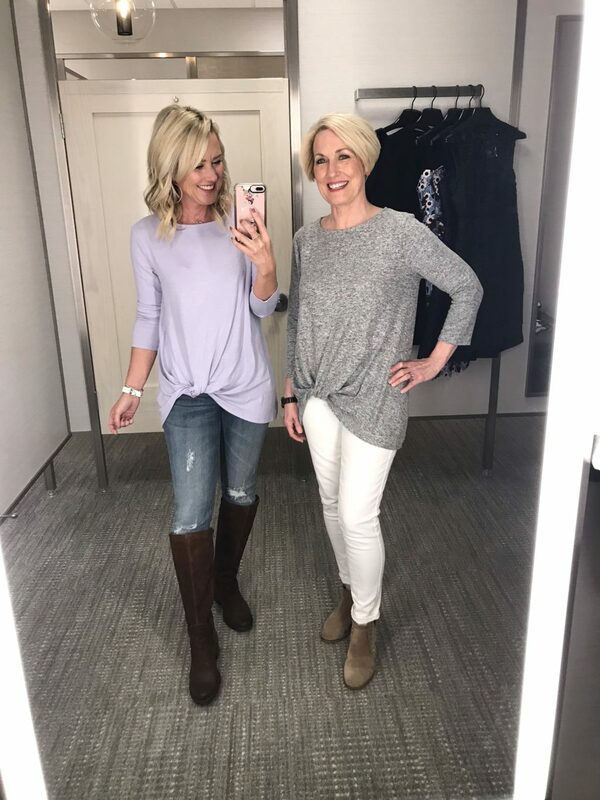 The lilac is a fun, fresh option for Fall! We’re both wearing XS. 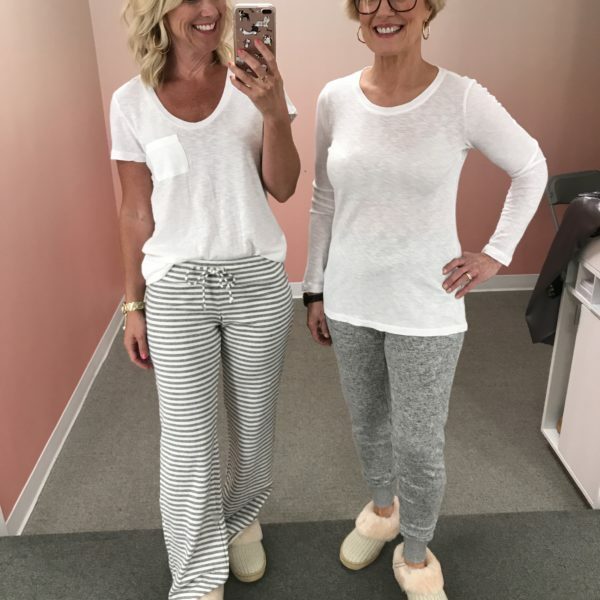 You know that jersey knit material of pajamas? Yeah, that’s this top. Plus, it has the sweetest gather on the back, giving it a little feminine touch. But mostly you’ll want to sleep in it! 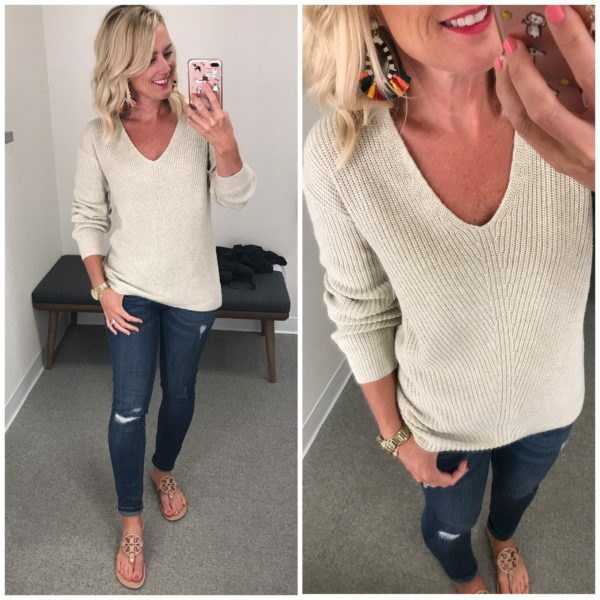 You’ve seen me wearing this v-neck pullover several times already (here & here)! It’s another Gibson piece in their signature fleece, with the perfect v-neck and drapey fit through the body. I like it paired with this bralette, as well. Mom is wearing a petite XS. A regular XS would be long enough for leggings for her! 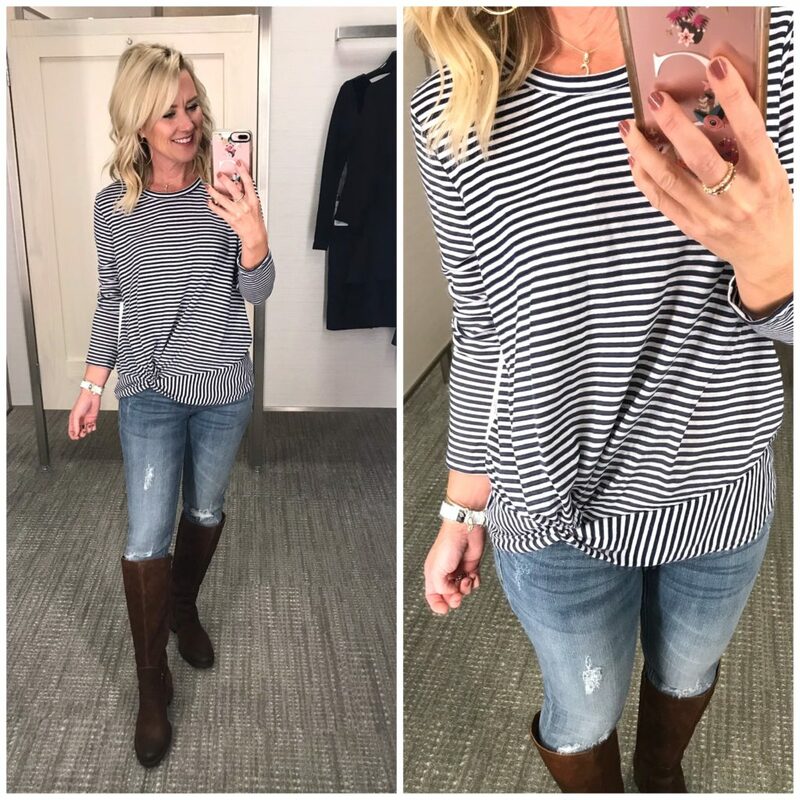 This top is a basic long sleeve tee, but with a twist. Literally. The hem has a fun twist, giving it the illusion of a half-tuck. It’s a soft, t-shirt cotton, and the stripes come in a few colors. Let’s stop and stare at Miss Sassy Pants in her too-cute-for-words casual Friday style!! 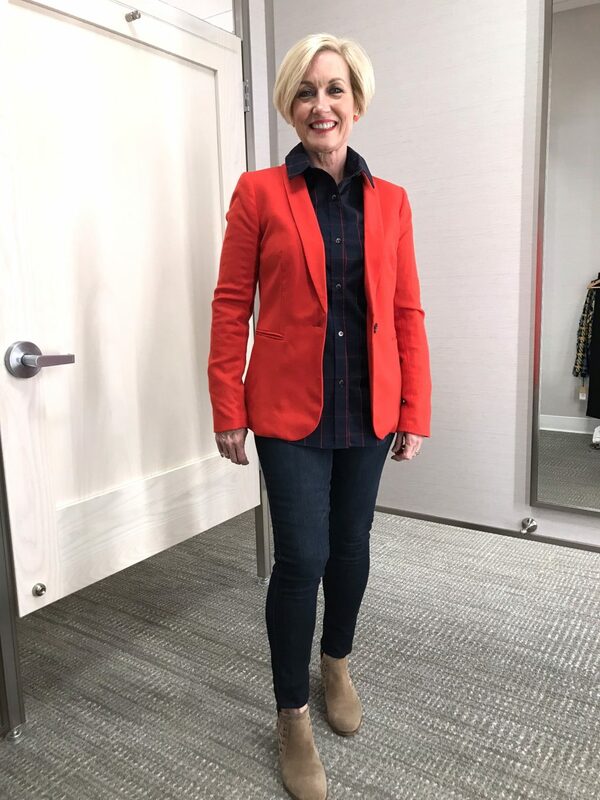 The dark jeans are favorites for her (dark rinse and super stretchy), and she loved the fit of the blazer for both work and weekend. The oxford is a nice structured cotton with extra stretch. Fit Tip: She’s wearing a 4p jacket, XS shirt, and size 2p jeans. Talk about sassy workwear…leopard in the office, anyone?! This skirt is a thick knit jacquard with a great beige and black leopard print. It zips in the back and has the slightest a-line shape. The weather is knit with cute ties on the cuffs. Both pieces are 40% off! Fit Tip: I’m wearing XS sweater and reg 0 skirt. Let’s move along to dresses…holidays are practically upon us, you know! I love the colors of cornflower blue, plum and black of this lace sheath. The material is thick and substantial, and fully lined. The straps are adjustable for a better fit on top, and it bends to fit your shape. Fit Tip: This brand runs a little small, so I sized up to a small. I get a lot of requests for long sleeve dresses, especially in colder months…and this one, my friends, is your winner! 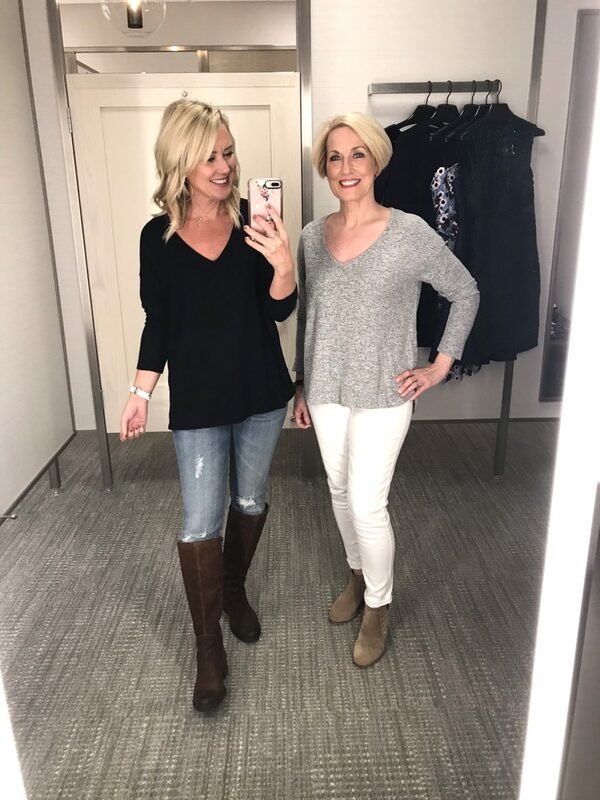 It’s a thick textured knit, so it’s super comfortable and easy to wear, but beyond chic with the jewel neck and three-quarter sleeve. The asymmetrical ruffle trim gives it a little sass. I’d wear it under a blazer for work, or with statement jewels for a festive event. 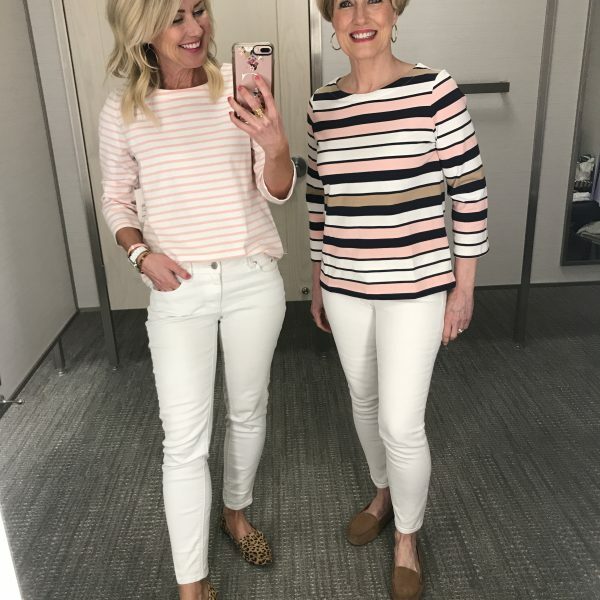 Mom is wearing the 2, as well, and it hugs her figure beautifully. Another long-sleeve option, this one with extra holiday pizzazz thanks to the velvet panels. It’s a deep navy, and the material is a thick, stretchy scuba-like material. So basically it holds everything in! Fit Tip: I’m wearing a 2 and it’s a body-con fit. The arms are a little long for me in the regular. 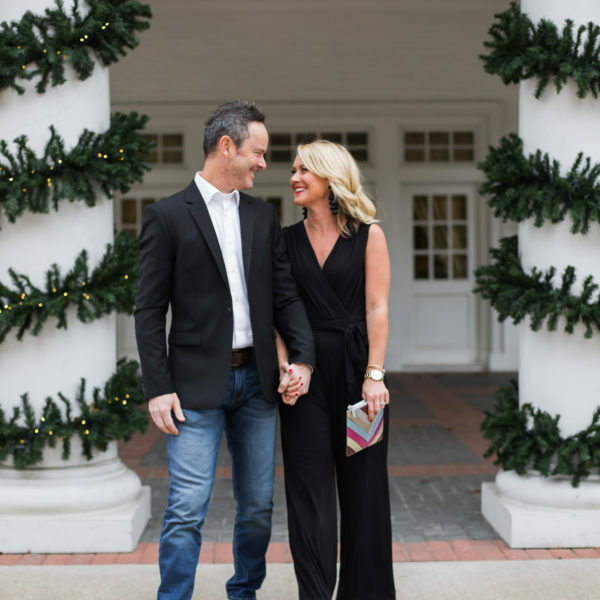 Mama SP made me twirl as soon as I slipped on this fit-and-flare…and obviously I happily obliged. That’s the true dressing room test, you know!! Does it make you dance with joy? It’s a rich satin jacquard with beautiful box pleats and square neck and back. Fit Tip: I’m wearing a regular a reg 0, petite sizes available. Mom is wearing a 4 petite. 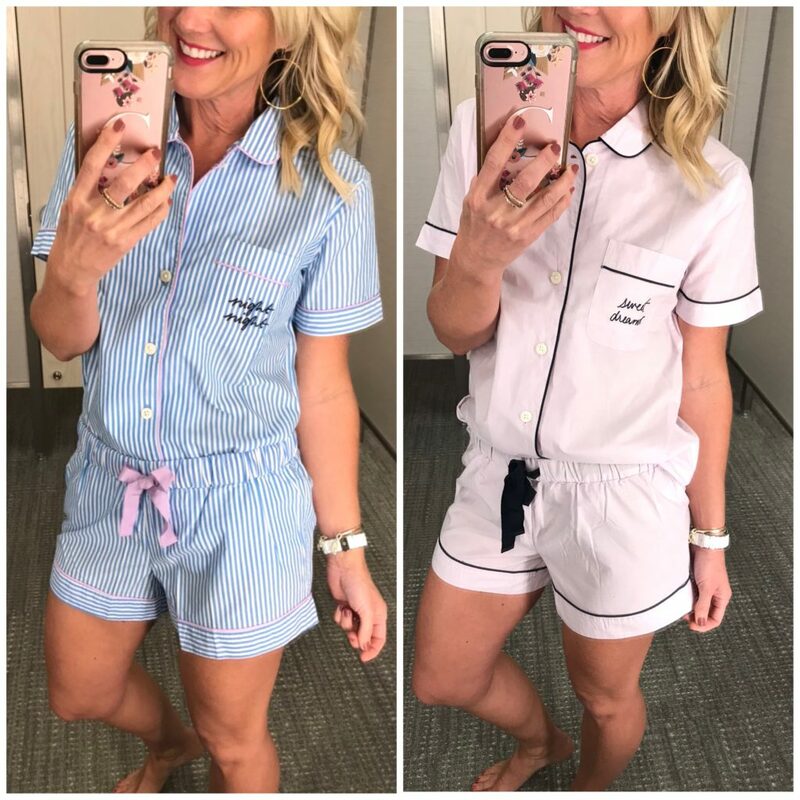 And finally, I found the cutest pajama sets in crisp cotton. 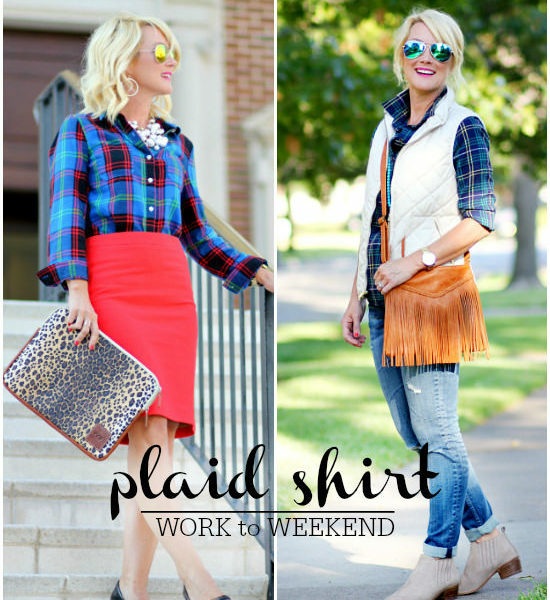 Both have contrasting piping and darling embroidery on the pocket. The waist is elastic with a functioning drawstring. 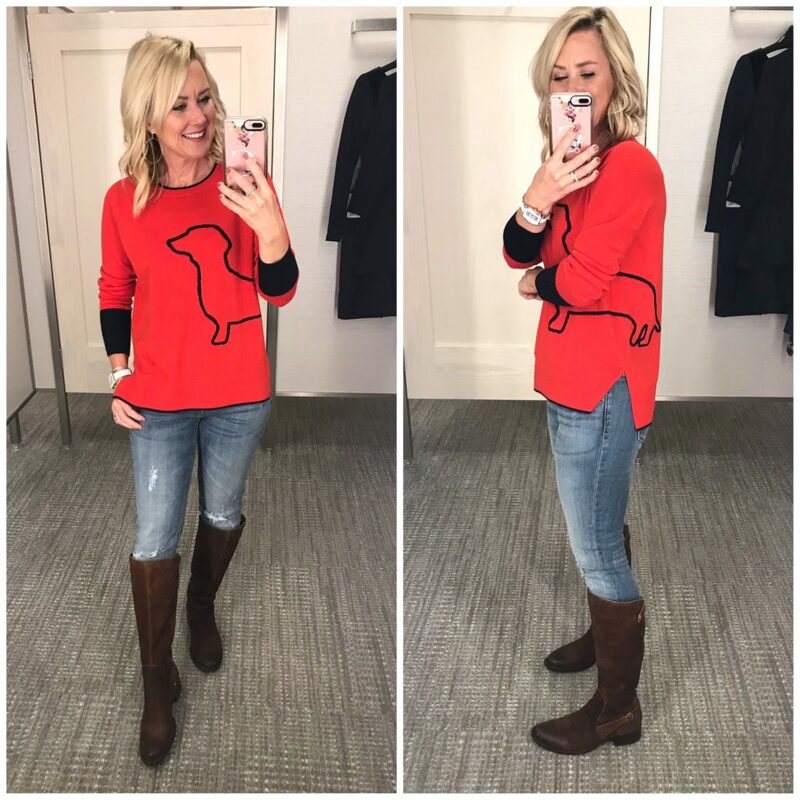 Nordstrom // Huge same-season sale, including these suede knee boots! Colleen Rothschild // 25% off site wide Friends & Family event. Check out Mama Sugarplum’s skincare post for her faves! Thank for sharing. Love seeing all the piece, especially loved the twist-front striped tee and the fit and flare dress. Great finds! Thanks Susanne…I hope the post was helpful! happy Friday! 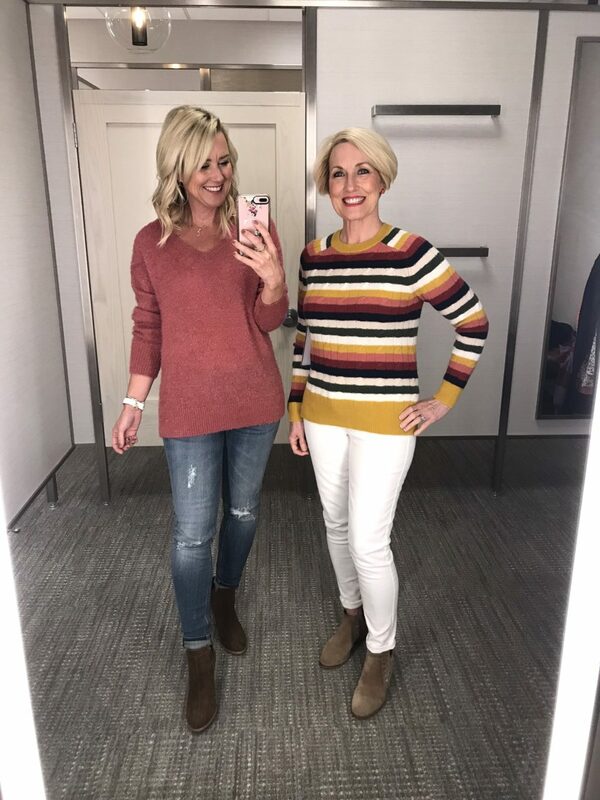 So many gorgeous sweaters! 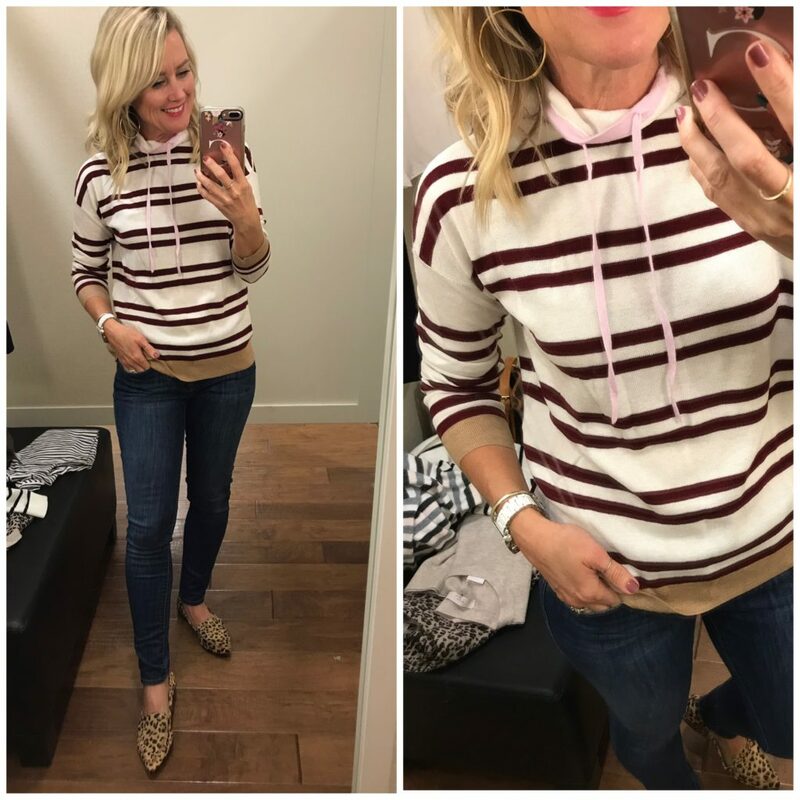 Is the plum/pink striped one called “red stripe” online, or have they perhaps sold out of the color you tried on? I love the one you tried. You and your mom are so adorable. Thanks for sharing your finds! Lovin’ on that hooded pullover, and doxie dog sweaters. You all hit the motherlode this time! 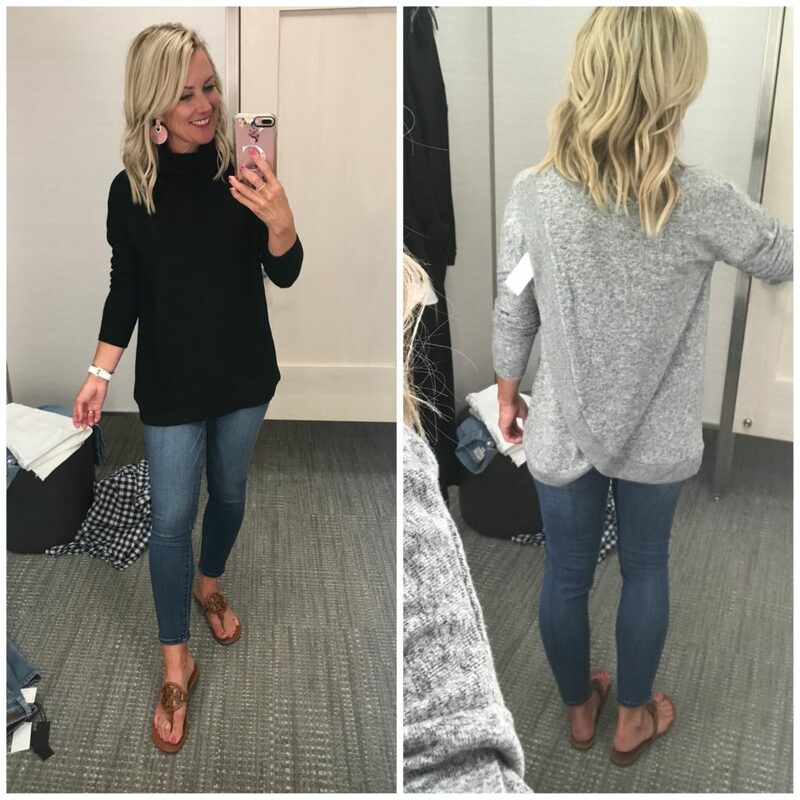 The link for the split back tunic goes to a different sweater. Can you please share the correct link? I can’t find it when I search on Nordstrom’s website and it’s so cute!